MACKINAC ISLAND, Mich., Sept. 1 /PRNewswire/ -- Mission Point Resort, Mackinac Island's largest and most diverse resort, is announcing a "Fall Stimulus" promotion with a sale on fall vacation packages that is the most affordable on the island. The two-week fall special will run from Sept. 1-14. Guests who book a vacation during that two-week period will receive sale prices in September and October. Each package represents a savings of over $200 for weekdays and $350 for weekends off the island's typical fall rates. 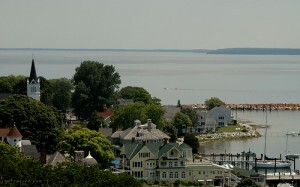 There is no prettier place for a fall getaway then Mackinac Island. When the island's hardwoods turn to scarlet, rust, gold and orange guests of Mission Point Resort will be awed by the views. Color tours will be available around the island and to the nearby shores of Lake Huron. This is a wonderful opportunity for families, children and adults of all ages to experience a beautiful fall color getaway at affordable rates. Below is a sampling of the packages being offered. Additional adults and children may be added for a fee. Economy Buster Basic starting at $329 for two - Includes two nights lodging, round-trip ferry tickets and two breakfasts. Economy Buster Original starting at $399 for two - This is the popular package that started it all in the spring and it is now back for the fall. It includes two nights lodging, round-trip ferry tickets, two breakfasts and two dinners. Economy Buster Plus starting at $599 for two - This is the complete Island experience for one set price that you cannot find anywhere else. It includes two nights lodging, round-trip ferry tickets, two breakfasts, two dinners, as well as tickets to popular island attractions such as Fort Mackinac, Carriage Tours, 18-hole Mini Golf, Butterfly Museum, Tower Museum and Bike Rentals. Economy Buster Senior starting at $369 for two - This complete package for seniors includes two nights lodging, round-trip ferry tickets, two breakfasts, two dinners and two round-trip island shuttle tickets per person. For more information on the "Fall Stimulus Package" sale and to reserve your affordable fall vacation getaway (remember that Mission Point has great family rooms), go to www.missionpoint.com or call 1-800-833-7711.